Deidra Maher whored her way through France and Spain to earn passage across Morocco, Algeria, and finally to Mali. Since inheriting the cipher from her great-granduncle as his only living relative, she spent the next five years accomplishing what he had failed to do in twenty. Shon Knowles certainly had a keen mind but not a brilliant one, so the secret of the cipher eluded him. However, his great-grandniece was considered a prodigy, though an undisciplined one, yet it still took her half a decade to master the ancient code. It was unusual for a woman to travel alone, even a European one, in Islamic nations, but she was now posing as a reporter covering the first Festival au Désert to be held in the region since 2013. Making her way through the horde of residents and tourists along Askia Mohamed Boulevard in Timbuktu, Deidra arrived at Hotel Colombe 2, a modest but adequate accommodation. She only planned to stay for a day, two at the most. For the present, comfort was her main interest. The city had once been a hub of Islamic learning many centuries past, but eventually began to decline and finally collapsed under the heel of French rule. Yet, the cipher contained a map to what Knowles believed were long forgotten tunnels under Mosquée Sankoré. All she had to do was break in. Disguising herself as a young Muslim male (the dishdasha and keffiyeh she wore covered a multitude of “sins”), she entered the mosque toward midnight for Isha Salah or the night prayer. Fortunately this time stealth rather than violence allowed her to slip away, locate the antechamber, no longer commonly used and indicated by one portion of the cipher, and then press a specific set of stones in the required order to release the long unused entrance to the tunnels beneath. She replaced the minuscule scroll in the golden teardrop she wore on her right auricle lobe (hidden by shoulder length hair and her keffiyeh) since it was no longer required, and after closing the portal behind her, made her way downward, using the flashlight of her smart phone for illumination. Beneath was a hoard of scrolls and copper codex records that were worth a fortune if she were able to sell or ransom them. Even auctioning the location to the right people would make her an instant millionaire, but she considered millions paltry compared to what she was after. Finally, the young treasure hunter located her prize, though it was written on hardened clay instead of parchment or copper; the location of the lost caravan which had carried untold wealth in gold an ivory. It had vanished on the way to the city in the mid-12th century and the mysterious seer known only as the Oracle wrote its location in the same cipher he had placed on the scroll she possessed before he died. There, east of the city, the exact place where her riches were buried. Tomorrow, she’d travel to the site to verify the find, then she’d need help. Those fools at Yale University and the Mission Culturelle de Tombouctou had been hounding her to add her exceptionally agile mind to their archaeological efforts in exploring this region. All she had to do was agree and subtly guide them to what they would believe was the Iron Age tell they had been seeking for the past fifteen years. Once they had done all of the dirty work for her, she would contact the Dahomey descendants whose treasure this rightfully was, and they could reclaim what was stolen from them nine centuries ago. This time violence would be necessary, but by the time the authorities were alerted of the slaughter of the archaeological party, she and her accomplices would be in another country. On her deathbed, Great-Grandmama Nawee, who claimed to be well over a hundred and was said to have fought the French in the 1920s, revealed her heritage to the then teenaged Deidra, as well as the fact that Knowles had pilfered the golden teardrop earring, the last artifact she possessed of her past and the tribe of true “Amazon” warriors. Knowles had earned the death Deidra arranged, the poison being subtle and the results easily mistaken for heart failure. Now she would honor Nawee and those few left who were her kin. Of course, she would not be joining them for long. Her debt to Great-Grandmama repaid, she would take her cut once the wealth was liquidated, and leave her Beninese cousins to whatever fate would choose for themselves. Deidra had her eye on an island in the Caribbean near Bahama that was for sale. She had always wanted to retire before the age of thirty. Since the Pegman is MIA this week, I chose my own location based on today’s Phantom comic strip. 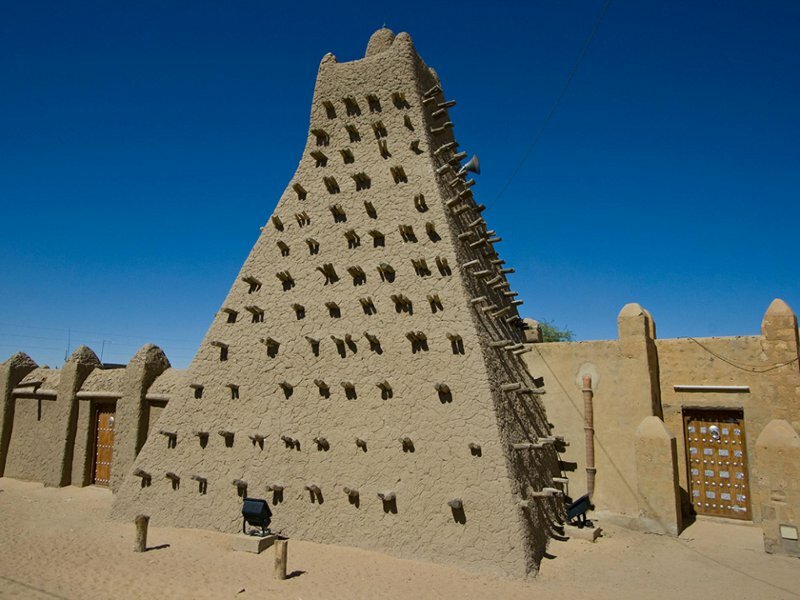 My research included the city of Timbuktu which is in the nation of Mali, the Festival au Désert, and the Sankore Madrasah and Mosque (my description of the interior is totally fictional). I also had to find out about Salah or Islamic prayer times and a little about the Dahomey Amazons. Oh, there really are private islands for sale in the Caribbean just in case you were wondering, although most of us couldn’t even begin to afford them. You’re welcome. Glad you liked the story.